Thousands of people protested in Serbia against President Aleksandar Vucic on Saturday. Authorities accuse the opposition of planning the violence and deployed a heavy police presence inside the parliament building in Belgrade. 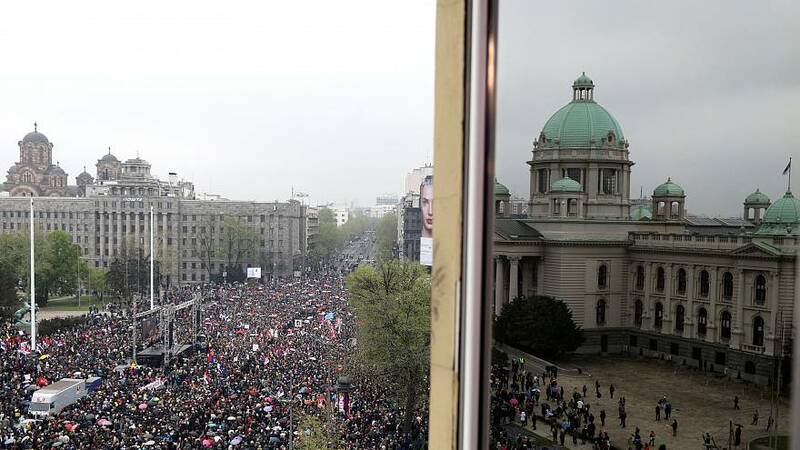 The Serbian Interior Ministry estimated the crowd's size at up to 7,500 people. Organisers said numbers were far bigger. Ahead of the rally, tensions increased as pro-government media and officials alleged that the opposition wanted to take over power by force. The demonstration was organised by the Alliance for Serbia (SZS), a broad grouping of 30 parties and organisations, which started weekly protests in December. Since December, the demonstrators accuse Vucic of an autocratic rule and demand more democracy and media freedom. The ruling SNS-led coalition has a majority of 160 deputies in Serbia's 250-seat parliament. Vucic has also staged a countrywide campaign and scheduled a major rally in Belgrade for April 19. The SNS party leadership has said it wants a snap vote but no decision has been made so far. Vucic denies being an autocrat.